Sports Costs > How Much Does Framing a Jersey Cost? How Much Does Framing a Jersey Cost? 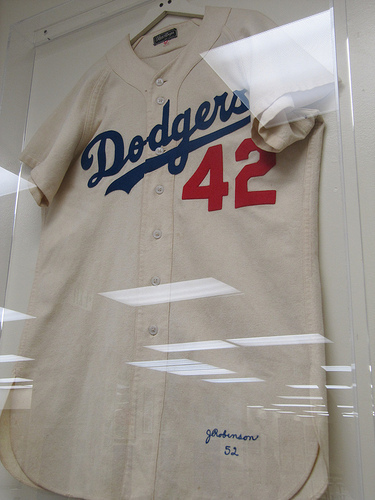 Framing a jersey, signed or worn by a favorite athlete, is a popular way of preserving the jersey. Whether you want to do it on your own or hire a professional, it’s going to come at a cost. How much does it cost to frame a jersey? On average, framing a jersey can range anywhere from as little as $175 to as much as $550. It is going to come down to the type of frame, the size of the frame, if any customizations are going to be made, and the company framing the jersey. At Michael’s, a popular arts and crafts retailer that offers customized framing, had told us the prices could be anywhere from $400 to more than $600 based on the factors we had mentioned and if we had a coupon. A member on this forum thread at BlowoutForums.com said he had paid $400 to have a jersey framed at Hobby Lobby. Another member said he had paid about $300 for his, while another member paid $200 for an online framer with free shipping. Jersey framing, just like a basic framing job, can be done in various styles and sizes including a special UV-protective glass, suede, outline matting and/or Plexiglass frame. A basic framing can include a plain jersey framing, with one or two photos on a regular frame or even with the team colors on the matting. The more expensive options may include a suede matting, mahogany frame, UV- protective glass and a team logo patch. As with anything, the higher the quality, the more it can cost. The overall price of jersey framing is also influenced by the type of add-ons chosen as mentioned in the first point. Adding a full plate and a photograph, for example, can add $60 to the basic frame. Also, opting for a mahogany frame instead of a standard frame can add another $100 to the estimate. Getting the jersey customized with a team logo or a team font can also add to the cost due to the added designs tailored to a specific team. Other customizations that can increase the price include matting using client-specified colors and molding. Jersey framing is a process that involves precise ironing and pinning inside of a durable frame with a protective plexiglass. The pinning is done using specially designed stainless steel framing pins that secure the jersey to the matting without damaging or discoloring the jersey. Depending on the type of framing service chosen, the jersey framing may include a single or double paper matting in the player’s team colors or custom to your liking. Customizations are also offered such as adding a team logo, adding a nameplate and/or a team font. Most companies require two to four weeks from the time they receive the jersey for framing and delivery. The timetable often depends on the location and the order. Some jersey framing companies offer framing add-ons like UV protective conservation glass ($29), Plexiglass ($20), suede matting ($69 to $79, or $20 per sheet), a mahogany frame upgrade ($99 to $119), full plate ($29), inset photo ($29), inset ticket ($29 per ticket), floating plate ($29), digital photo frame add-on ($100), and/or digital video frame add-on ($200). These were the average prices quoted from various framing companies found online. Shipping costs may apply if you were to use an online company. If so, you should be prepared to spend about $50. Before choosing a jersey framing company, always check their portfolio and other past work they have done. This is to give you a good idea of their framing skills and expertise. It also doesn’t hurt to check their reviews online. Try to choose an acid-free matte as a matte that isn’t acid-free can slowly bleed onto the jersey over time. Also, try to upgrade to a UV protective plexiglass to help prevent the colors and jersey from fading. Compare rates with at least three different framing companies and take note of those that offer reasonable rates. It also doesn’t hurt to find a framing company that offers free shipping if you were to send it in online. While you don’t want to focus solely on the price, you will want to look at past examples and see what other people are saying about them online. A cheaper frame can sacrifice the quality in the future. Consider framing the jersey yourself using a display case shadow box. Many stores provide display cases designed for framing jerseys, which can cost about $50 to $200, depending on type, features and company. Pre-made jersey frames are also available at local craft stores such as Michaels and Jo-Anns. If you want to use a big box retailer, such as Hobby Lobby or Michael’s, always look for a coupon ahead of time as they always have them readily available. I had a local guy frame my autographed jersey for about $400. This included a nice cherry wood border and glass.